This soup was really good…and easy. It didn’t take a whole lot of time to make….and it made a TON…PLUS, it was CHEAP!! Melt 4 Tbl. Margarine in a large pot. Add onion, carrot and celery. Cook for a couple minutes. Add cauliflower and parsley, stir, cover and cook for 15 minutes. Pour in the stock, bring to a boil, then reduce heat and simmer for 15 minutes. In the mean time, whisk flour and milk in a bowl. Melt 4 Tbl. Margarine in a medium saucepan. Add the flour/milk mixture….heat through. Remove from heat and add half and half. Simmer for 15 minutes. OMG…this soup is SO SO SO good!! I LOVE it!! It is really good with the bread, too. The Apples were so crunchy, juicy and yummy….mmmmm. I was actually oogling the cookie recipe this afternoon….so, I was just tickled pink when my neighbor’s daughter brought us the cookie surprise!! Open one of the vege broth cans and measure 1/2 Cup…put into small pot…add the Liquid Smoke and Old Bay Seasoning and bring to a boil. Add TVP, stir and remove from heat. Cover until ready to use. Saute onion over medium heat until almost translucent; add garlic and cook for 1 more minute. Add broth, water and spices and bring to a boil over high heat. Reduce heat to medium high and add potatoes and cook until fork tender. Reduce heat to medium low and add TVP and cook until heated through. Make any adjustments with spices at this time. Just before serving, add the cream and allow it to heat through. Great with a green salad and some crusty bread, or as a meal on its own! 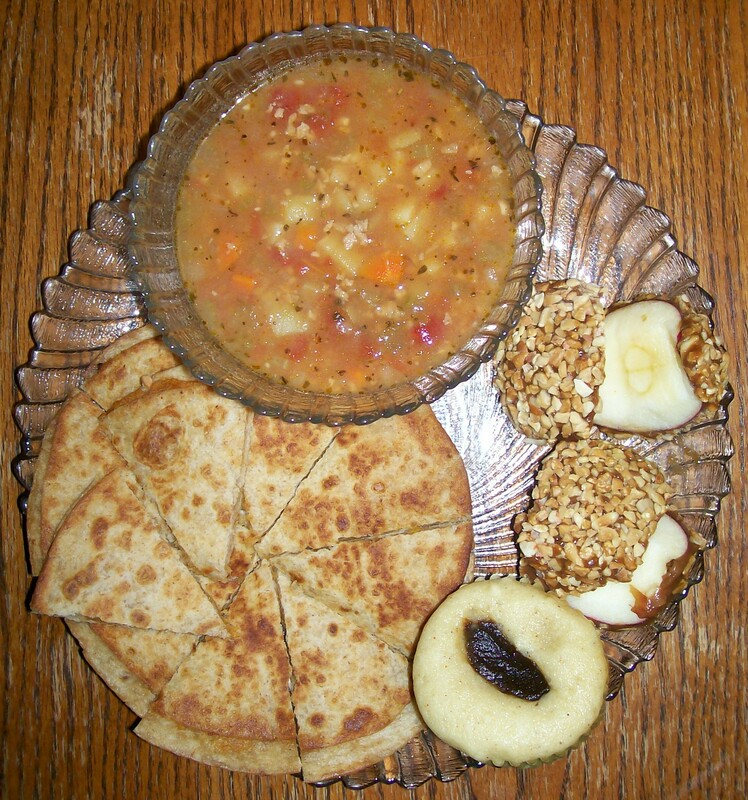 Clockwise from top: My Veganized version of My Mom’s Autumn Soup, Caramel Apple, Fat Tuesday Jelly Muffin, Sweet Potato Quesadilla. The soup was awesome!! We liked the idea of the sweet potato quesadilla; however, next time, I will make is way more “sweet” vs. the savory that the recipe calls for. The cupcakes were awesome, even though they didn’t turn out quite like it should. 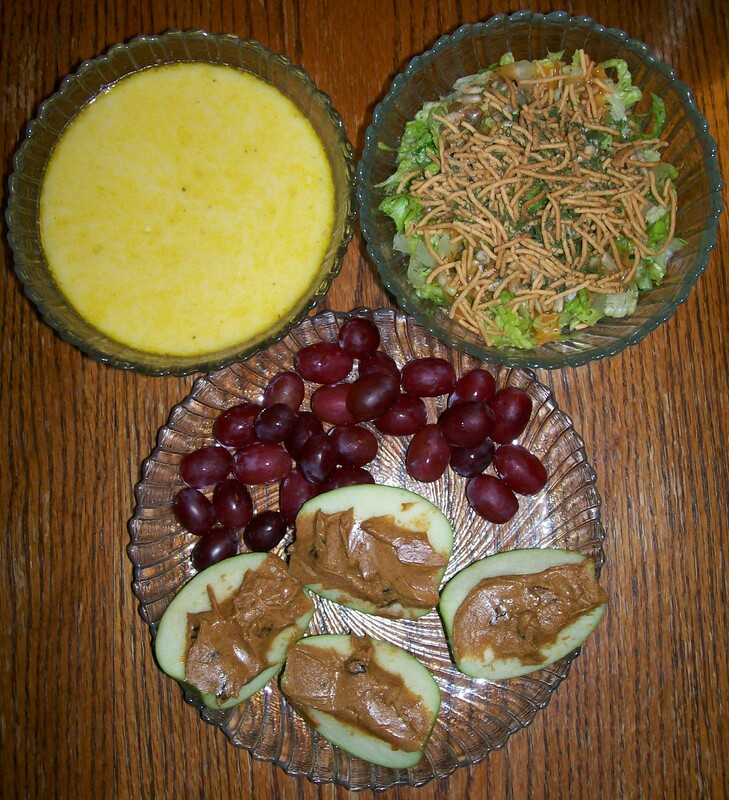 Recipes Below…. Combine the Vege Broth and Liquid Smoke….bring to a boil, remove from heat and add the TVP. Stir and cover until ready to use. Put EVOO in a deep pot, add onion and cook until soft…add garlic and cook for 30 seconds. Add the rest of the can of vege broth and the 8 cups of water. Add all veges and spices, stir to combine. Bring to a boil, reduce heat and cook until veges they are soft. Add the prepared TVP when the veges are partically done, to allow the flavors to mix. Add additional seasoning if necessary. Prick sweet potatoes with a fork and cook in the microwave until soft. Cooking time will vary depending on your microwave and the size of the potatoes. When potatoes are done, scoop flesh out of skins and mash. Heat oil on med-hi in a frying pan. Fry onions until golden brown. Add potatoes, cinnamon, cumin, sugar, and salt. Mix well and remove from heat. Heat a cast iron pan on medium heat. If using large tortillas: Spread a thin layer of margarine on one side of a tortilla. Flip over. Spread a thick layer of the potato mixture of half of the tortilla. Fold over. If using small tortillas: Cook the same as you would normally cook a quesadilla. Cook in cast iron pan on both sides until golden brown. Cut into three pieces. Serve. Preheat the oven to 350 degrees. Line 12 muffin cups with paper cupcake liners. Do not attempt to make these without the cupcake liners, which is what I did. I sprayed my pan with nonstick cooking spray and most of them stuck to the bottom. 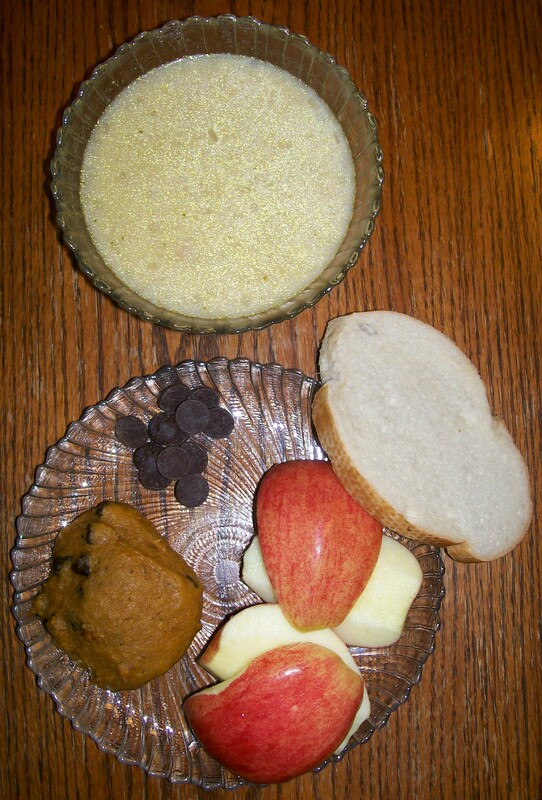 Mix together the “milk”, apple cider vinegar and cornstarch. Set aside. In a large mixing bowl, sift together flour, baking powder, baking soda, nutmeg and salt. Create a well in the center of the flour to pour the wet ingredients into. Stir the “milk” mixture with a fork to dissolve cornstarch then pour into the flour well. Add the oil, sugar, and vanilla. Stir until well combined. Fill muffin cups 3/4 full with batter. Place a heaping teaspoon of jelly on the center of each cupcake. While it’s baking, the muffin will puff up around the jelly so it ends up in the center of the muffin. Bake for 21-23 minutes. The tops should be firm to the touch. 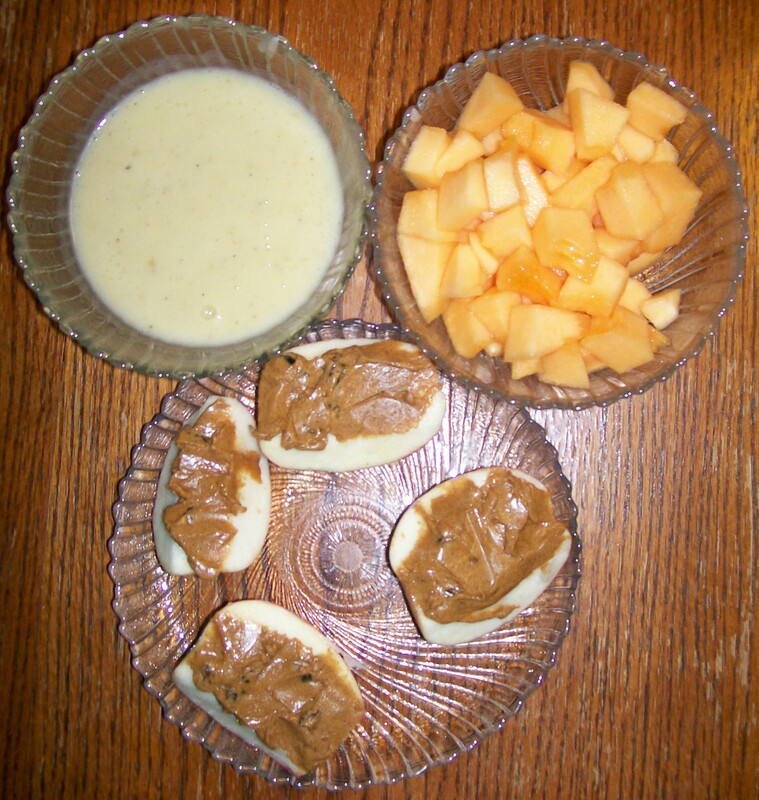 NOTE: I added the recipes from the websites that originally posted them, because it was already posted on-line; however, please give them some love and visit their sites….they got some good eats!! Mmmm!! The soup was pretty darn good (recipe below). The fruit was yummy as well. I really missed my vegan meals even if “eating out” was more convenient. 1. Put potatoes, leeks, salt to taste, and 10 cups of water in a large saucepan over medium heat and simmer, partially covered, until vegetables are tender, 40–50 minutes. 3. Off heat, just before serving, stir in the cream by spoonfuls (if using). 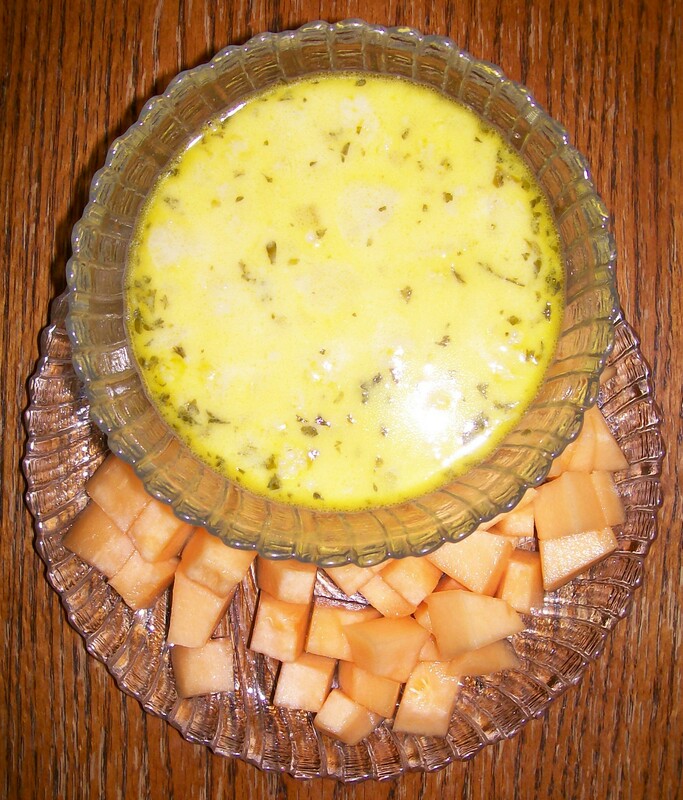 Pour soup into a tureen or soup bowls and decorate with the herbs. Add a little freshly ground white pepper, if you like. 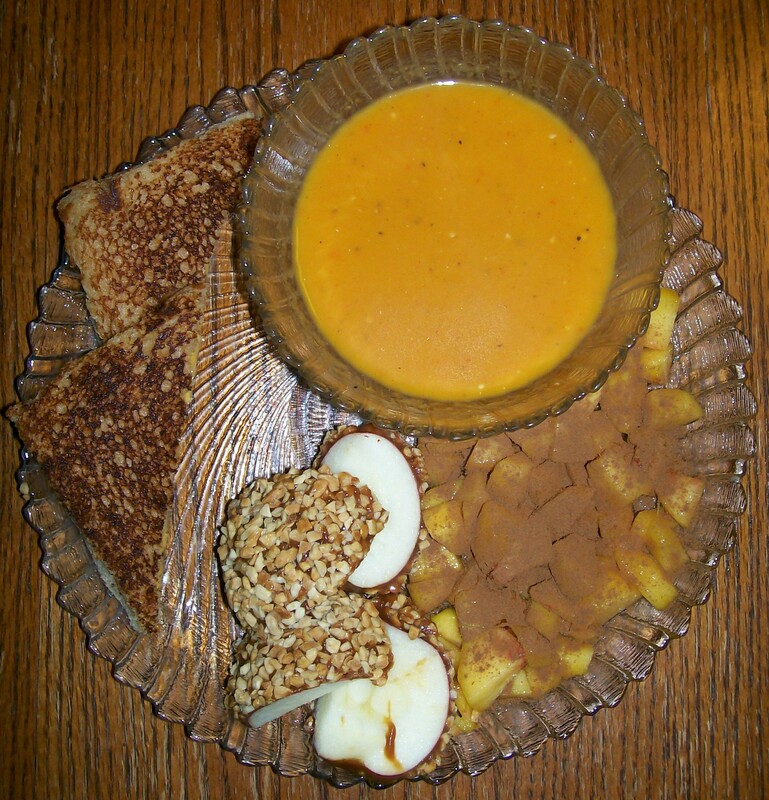 Clockwise from top: Homemade Tomato Soup, Peaches with Cinnamon, Caramel Apples and Grilled Vegan Cheese Sandwich. My son had asked for tomato soup and grilled cheese sandwiches….so since today is his birthday, he gets the dinner he wants. Preheat the oven to 400 degrees and put the tomatoes in a large, lightly oiled cookie sheet (with sides). Sprinkle with sale and pepper and roast until soft, about an hour. Let cool, then remove the skin of the tomatoes. Meanwhile, saute the onions/leek(s) in the EVOO until they begin to soften…add the bell pepper and continue to saute until peppers are soft. Add the broth, carrots and garlic and bring the mixture to a boil. Turn heat to medium low and add basil, brown sugar and milk alternative. Simmer for 10 to 15 minutes. When the tomatoes are done, puree the tomatoes and the broth mixture in a food processor or blender until smooth. (You may need to do this in batches.) Return the soup to the pot, season to taste and heat through. *This is an adaptation of two recipes from two different cookbooks. Typically, when making a “meal plan” people will assign certain meals to certain days; however, I found that for me, this just didn’t work. What HAS worked for me is to plan certain meals between runs to town and then make whatever happens to “trip my trigger” for the day. I like to have several “types” of meals available: super easy, pretty easy, a little challenging and then a couple absolute new meals (which may be really challenging.) Since we are also on a budget, I tend to shy away from too many desserts; however, I will try to serve at least one per week. In any case, this is my current plan…..and provided that I remember, I will have photos and recipes to share as the days go by. Open one of the vege broth cans and measure 1/2 Cup…put into small pot…add the Liquid Smoke and bring to a boil. Add TVP, stir and remove from the heat. Cover until ready to use. Saute onion over medium heat until translucent; add garlic and cook for 1 minute. Add broth, water and spices and bring to a boil over high heat. Reduce heat to medium high and add potatoes and cook until fork tender. In a pan, add oil, wine and kale, cook until just barely wilted. Reduce heat to medium low and add TVP and kale and cook until heated through. Make any adjustments with spices at this time. This is a vegetarianized version of Olive Garden’s a sausage and potato soup.